Want to learn how to make whiteboard videos or whiteboard drawings? Here’s the list of best Whiteboard Animation Software to create your own whiteboard videos. We are quite sure that you agree with this – Whiteboard animation videos and whiteboard drawings are the most amazing way to present eye-catching presentations and awesome visual content in any situations. As we all know, the present time is the time for videos and short clips. You can find thousands of online videos tutorials, introductory videos, and how-to guide videos on different video streaming sites like YouTube, Facebook, Vimeo, DailyMotion, and Instagram etc according to your need. If you want to create attractive whiteboard animation videos, you need to use the proper set of animation video maker tools and add some impressive content to it and it won’t take much time for it to become viral. There are plenty of animation creation tools used by the video creators and one of these tools is whiteboard animation software or whiteboard video maker. Using good whiteboard animation software, you can create your own whiteboard videos, whiteboard presentation, and whiteboard drawings like a professional. Before checking out some of the best whiteboard animation services or free whiteboard video creator tools, let’s know in brief about Whiteboard Animation. Here we go. Whiteboard Animation is just a video creating process which is created using different objects or animations. To be precise Whiteboard animation videos are the videos in which the creator is not present himself or herself but the video draws itself i.e. on the video it will show a hand drawing objects, shapes or pretty much everything. Majorly, it is used in television advertising and internet advertising to deliver messages in a very simple but unique way. YouTube and Vimeo are some of the most popular video hosting sites to find stunning whiteboard animation examples and whiteboard animation templates. We all know that Whiteboard videos, drawings are in huge demand and you can easily create whiteboard animation videos related to any topic using a good whiteboard animation program. Recently, we have received many requests from our readers like how to make whiteboard videos and which is the best animation software which they can use? If you search on Google “animation video maker” or “whiteboard animation software”, you will get thousands of results and it can be a really very difficult situation for you to select the one and only best whiteboard video creator. And that’s the main reason for us to bringing out this whiteboard animation creation software guide where we are going to list top 10 best whiteboard animation video maker to make whiteboard videos for free. Do you want to transform visual ideas into video instantly or create your own custom drawings for whiteboard video? If “yes” then Sparkol VideoScribe is the most popular animation video maker software to make your own whiteboard video animations for you. If you are a newbie trainer or are into the creation of how-to animation videos then you need to use this amazing whiteboard animation software because it’s extremely easy to use and anyone can easily design a whiteboard animation video with it. Even, this whiteboard video creator is compatible both with Windows operating systems and Mac. If you are using any smartphone which runs on Android, iOS or Amazon OS then you can install this 3D and 2D animation software on it too. The cloud storage can be used to store your created whiteboard videos and whiteboard drawings. 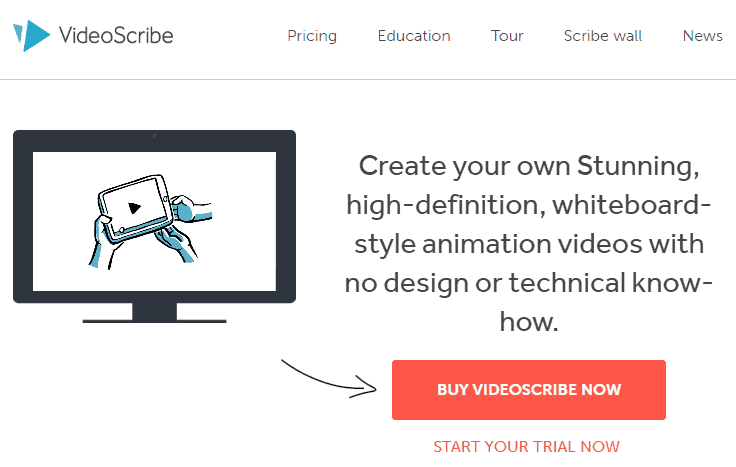 VideoScribe by Sparkol is a premium whiteboard animation service and you have to pay $4.08 per month if you buy the early subscription or $29 per month if you buy the monthly subscription which is a quite affordable whiteboard animation video pricing. PowToon is another best animated video maker tool which you can use to create animated videos and presentations. It comes both in free and premium options, so if you are looking for free animation software you can try PowToon’s free plan. With the PowToon’s premium plans you get: 24/7 Premium Support, Full privacy control settings, PowToon watermark and outro removed, Additional music and whiteboard animation images and styles, HD download to computer and upload to YouTube, 15+ mins in video length, and much more. The easy to use interface of PowToon allows one to create whiteboard video without any issue and also helps in creating whiteboard presentations. You can take help of the ready-made whiteboard animation template to design a video animation which will not only save your time but also will get you a video with high quality. You can not only use Easy Sketch Pro for creating animation videos but also for generating leads through it. There are many advanced features of this whiteboard animation video software with one being the option of publishing the videos online. You will also get an analytical report of the whiteboard videos which you have created or uploaded telling the number of views, the money you made and much more. The life hot spot feature of this best animation software allows you to create interactive animation videos. Easy Sketch Pro comes with three different whiteboard animation video pricing and plans – Starter ($37), Business ($67), and Business Pro ($97). You can select the plan according to your need. If you are looking for a professional whiteboard video creator then you should use GoAnimate. To use this tool you don’t have to install any software as all you need is an internet web browser and you are ready to create whiteboard videos. This animation video maker provides many interesting features with one being giving the option to hire professional actors who will record audio for your videos. Try out the GoAnimate whiteboard animation online tool and make professional animated videos and presentations. GoAnimate is available with three different subscription plans – GOPUBLISH (US$39/month or US$299/year), GOPREMIUM (US$79/month or US$599/year), and GOTEAM (US$159/month or US$999/year for 1 seat). You can try the GoPremium plan Free for 14 Days! Explaindio is a well-known video content creation software that allows you to combine 2D animations and 3D animations, whiteboard sketch elements, and full motion video. It is the best whiteboard video creator tool which one can use to make their brand by creating an impressive whiteboard animation videos and whiteboard explainer videos. The user-friendly interface of this tool makes it very easy for even a novice to use it. Explaindio also has an option to create doodle sketch which will make your videos more impressive. You can use the 7-day free trial before going for premium membership. If you are still wondering how to make whiteboard videos online then you should check Moovly. This is one of the best online video animation software and services which comes with a help section to tell you how to create a whiteboard video from scratch. You will find many other whiteboard animation tutorials as well which will make your videos impressive. Moovly comes with many advanced options with one being the ability to edit, delete, restore and view your videos. The videos which you have created using Moovly can also be downloaded on your computer for free. Once you have created any video using this popular animation video maker, you can publish it directly on YouTube and Facebook. Moovly comes with a very low-cost whiteboard animation video pricing and plans – Moovly Unlimited ($5/month) and Moovly Business ($300/year). 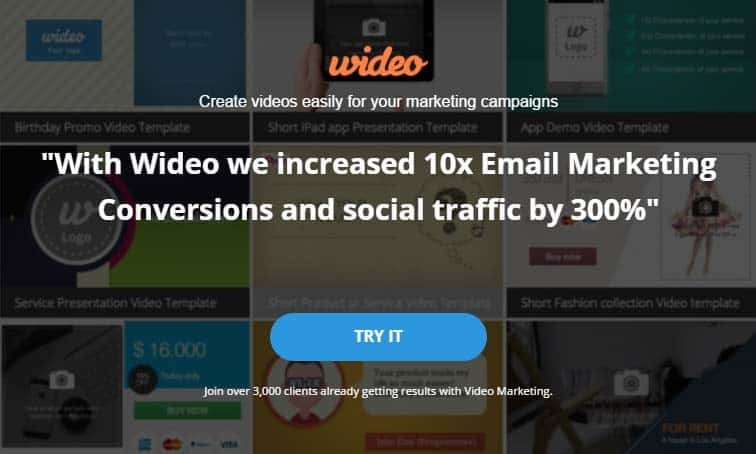 Try out this whiteboard video marketing software to create, customize and share your videos with ease. 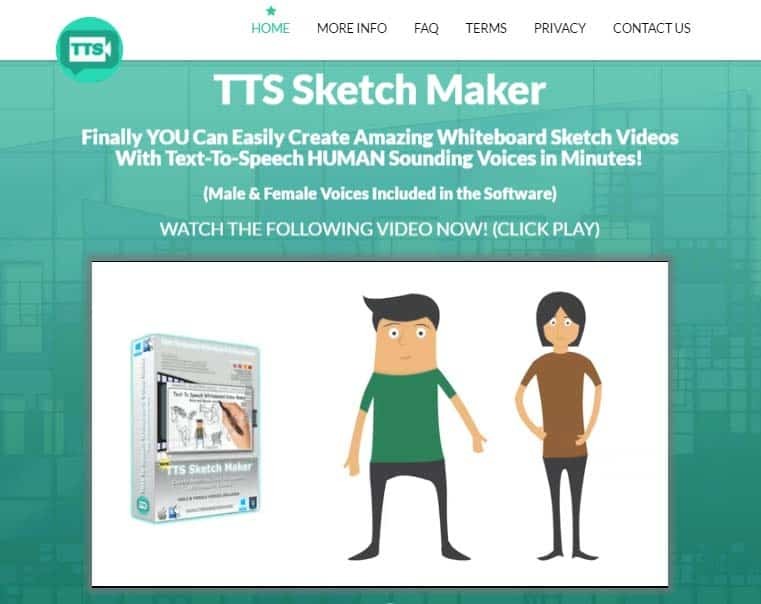 TTS Sketch Maker is not a free whiteboard video production tool but is a cheap one. This is one those useful whiteboard video services which are ideal for people who are not having a high budget and want to create good whiteboard videos. You can create interesting whiteboard videos with text to speech sound with just a few clicks. The interface of this tool is interactive and is user-friendly. You can select from 25 different accents to add to your video in this whiteboard video creator. TTS Sketch Maker’s regular price is US$97.00 but with the special offer price, you can get with one-off payment US$37. 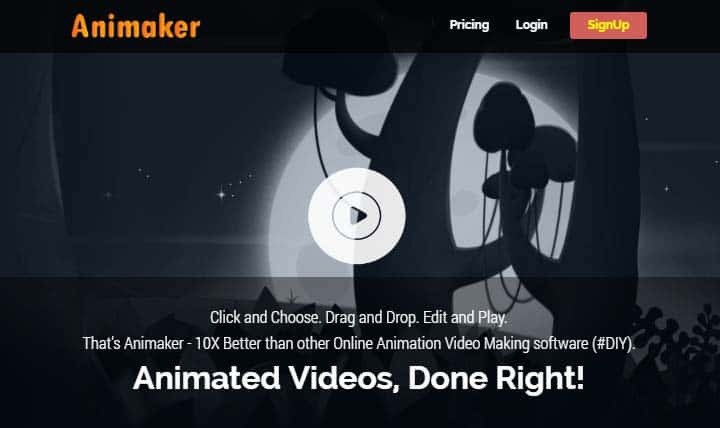 Animaker is also one of the best animation video maker tools which can be used to create whiteboard video, whiteboard presentation, and whiteboard drawings. This is a very widely used whiteboard animation software among the video creators, there are plenty of features and options to use this tool. Animaker comes pre-installed with many layouts which can be used for the creation of whiteboard animated videos. One of the best things about this whiteboard video creator tool is that you can also create presentations for free and also add content to each slide which you are creating. The next tool which makes to our list of top 10 best free animation software to make whiteboard animation is Wideo. 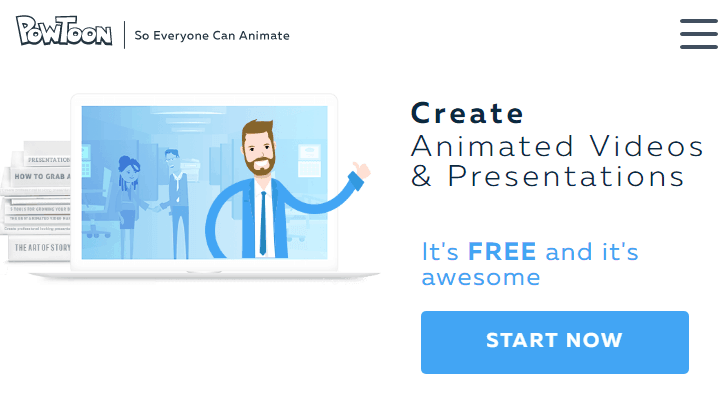 This is an easy to use whiteboard animation program which comes with all the amazing marketing campaigns animation features explained in other video creation tools listed above. If you are a new video creator, Wideo will be of great help as it has pre-installed layouts and lots of marketing video templates etc. You can also create a layout by yourself and then use it anytime you want to. Last but not the least is Explee whiteboard animation video software. Explee is a premium tool which is ideal for beginners as it comes with all the basic features needed for whiteboard video creation. You will get limited advanced options to use in Explee as compared to other whiteboard video creator tools. In order to try out the amazing features of this animation video maker tool, you can use the 14-day free trial. Explee consumes very fewer resources which make it a good option for people who are having a computer with fewer resources. Even the interface of this animation video maker is quite user-friendly. After hours of research and testing different whiteboard animation programs, we have compiled the above list of best whiteboard animation software 2019 (free and paid). We hope you found it useful to you. If you are a video creator then you need to use the best animated video maker software’s to make your whiteboard animation videos appealing. The layouts you get in the whiteboard video creators which we have mentioned above can be used for making videos more impressive. These are the top 10 best whiteboard animation video creator tools which are available for Windows operating systems. Feel free to let us know using the comments section below – Which free animation software are you using for creating whiteboard videos? Thanks this is really helpfull! Thanks for letting an awesome list of tools for whiteboard animation. Explaindio is the best tool for creating whiteboard animation videos. Thanks for sharing this post. Can we download this paid software as craze version? I’ve tried many software for whiteboard animation and finally, I have preferred to use VideoScribe as its very easy and simple with an amazing feature. but I would love to explore some of from this list as I’ve not used this.